Warning: Were I not blogging under my real name, this would have been much easier to write. I actually thought about using my nom de plume, Jack Gerouac, but I’m not really into hiding behind another name, hence the reason I blog with my own name. By the way, don’t bother looking for any posts written by “Jack Gerouac”, his blog Al Ha Derech was just me playing with WordPress over a year ago. Go ahead and laugh. Come on! You would think that since I’m attracted to Mussar, I would be all over change like the color black on my hat. At one point, many years ago, I was. I didn’t mind changes in location, routine, or the hard work involved in tikun ha’middos. Over the years, that has changed. Think about the famous smooth rocks that Rabbi Akiva found. Yes, they changed form and became rounder after years of being exposed to flowing water. However, they also were worn down and eventually went from having clearly defined edges to being smother. We all know that the Deled in Shema is enlarged because we don’t want to confuse it with a Reish (changing echad, one, to acher, other). Rav Hirsch expands on this and says that the Daled of echad is right angled and clearly defines where two points meet and become one, such is monotheism The Reish, however, is curved where the horizontal and vertical lines come together, showing the less defined way of polytheism. Just like effort can be gradual I have seen, in myself, that the Yetzer Hora applies the same tactic of gradually changing our path of getting closer to Hashem. I will not get into details, but since December I have been steered into choppy waters in the dynamics of relationships with others. I’ve been forced to confront lies, which ultimately distance one from Hashem. Most recently changes occurred in my employment status (and subsequently my LinkedIn status). There is also a change in my behavior that has been present for a while, but recently is being re-addressed proactively. In a growth mindset, people believe that their most basic abilities can be developed through dedication and hard work—brains and talent are just the starting point. This view creates a love of learning and a resilience that is essential for great accomplishment. Virtually all great people have had these qualities.Teaching a growth mindset creates motivation and productivity in the worlds of business, education, and sports. It enhances relationships. When you read Mindset, you’ll see how. After reading the back of the book, I realized right away that for most things in life I have a “fixed” mindset and it really stinks. Reading this book was an eye opening experience for me, almost on a par with learning Bilvavi Mishkan Evneh. When I first learned it, I experienced a complete paradigm shift in my relationship with Hashem. After getting into Mindeset I am now examining almost every thought, word, and action I have to see if it’s a fixed-related or growth-related. That is the easy part. The real work is changing who I have become over the years. This is the type of growth I was referring to at the beginning of this post. It’s real serious bechira-type growth. It is painful, but necessary. 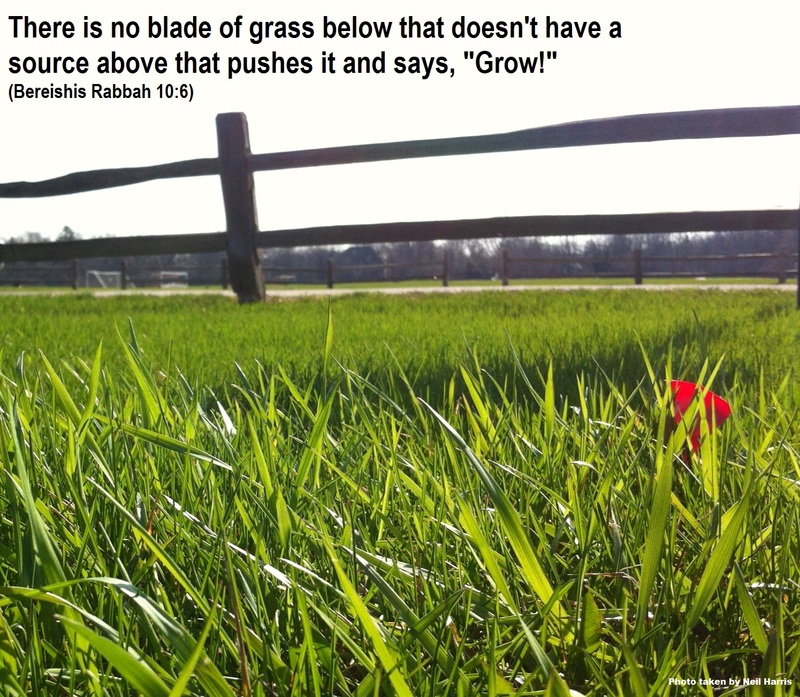 The midrash I quoted in the picture states that a source (or malach) give each blade a grass a push in order that it will grow. The message is that to become better people we need the cause and effect of “push and grow”. No matter how tough it is, I have to grow and become more that what I limit myself to being. 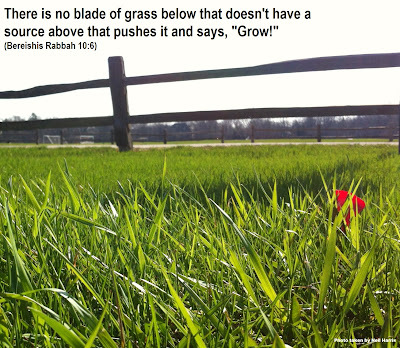 This entry was posted in growth, Hirsch, Mussar, personal on May 10, 2013 by Neil Harris. Recently a new website was started to relate and explain various teachings and concepts found in the writings of Rav Shimon Raphael Hirsch z’tl. The site reflects years of study, thought, and teachings of Rabbi Gershon Seif. Rabbi Seif is a friend of mine and I have been privileged to hear him give shiurim on the teachings of Rav Hirach for a number of years every Shavuos night. He is a true Talmid Chacham who is keenly aware of the challenges facing the Torah observant Jew today. This entry was posted in Hirsch on June 13, 2012 by Neil Harris. Pesach is z’man cherusanu, the time of freedom. Rav Hirsch explains that until the time of Hashem taking us out of Egypt, all cultures had slaves. It was how the world worked back then. B’nai Yisrael were the first “free people”. The concept of freedom, prior to our Exodus was something that the world didn’t understand or couldn’t even comprehend. With this idea from Rav Hirsch in mind, I look upon the next week and especially the seder nights an opportunity to anchor myself to a freedom that is true. The freedom to recall and bring to action the unique role of being both a child of Hashem and also a servant. We are all tied down. This can be both a positive and a negative. Being tied down to the role of a spouse and a parent is a wonderful bracha. Those responsibilities center us and become a lifeline to us. Feeling tied down to one’s job or economic situation can have a terrible effect on a person. True freedom is when we can decide what we want to put of strengths into. We can look at someone who lives a carefree life as being the most “free” of all men. However, making the choice not to play by any one’s rules and taking the “road less traveled” doesn’t always show true independence. To rebel l’shem rebellion, just to say that you are your own person isn’t always an example of freedom (there are those that, mamesh, rebel against society or a culture, in the name of Heaven, but I’m not writing about this). So I sit at my laptop, knowing that in twenty-four hours, I’ll be at my own seder with my wife, that I love and still have no clue how she puts up with me, my three children, that are each different and still all peas in the same pad, and my brother, who has traveled from NY to be with us, with family. I hope that they will have nice memories of our sederim and I will try to explain that the real freedom is to choose how you want to live your life. For me, based on my traditions, what I learned in yeshiva, from rabbis, and what I have read, it’s a freedom that boils down to what is my purpose and how can stay on track every moment of my lfe. 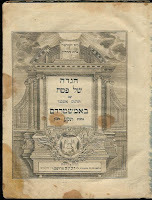 This entry was posted in Gedolim, Hirsch, lessons, personal, Yom Tovim on April 18, 2011 by Neil Harris. A few weeks ago I discovered that you can go to Apple’s App Store and get (for free) Mesillas Yesharim for the iPhone, iTouch, and iPad. The Mesillas Yesharim app is pretty straightforward, letting you chose either Hebrew or English. The English translation is fairly basic. 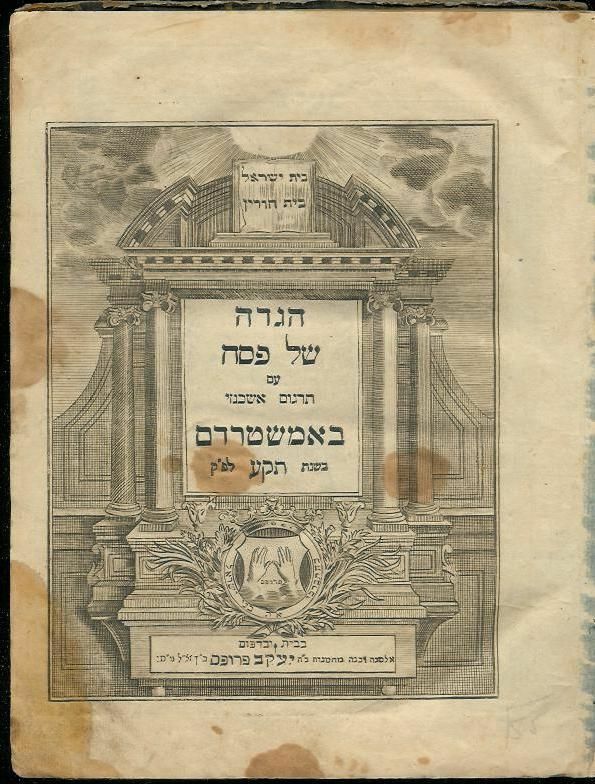 Of course, if you really want to learn the sefer in English, I strongly suggest finding a copy of R Yaakov Feldman’s excellent translation and commentary (I recently, after searching for a few years, found a copy at a reasonable price and it’s like I’m learning the sefer for the first time again). A full review of this app is available at jewishiphonecommunity.org. I also, using the built in pdf reader in iBooks, was able to put the original English translation of Rav Hirsch’s The Nineteen Letters on my iTouch. To upload it on your device, simply download it onto your computer, then import the pdf into iTunes (use the “add a file” option) and it will load and default under “books”. Then just plug in your iToy and drag the “book” to your your decice (the same way you would drag a song, album, playlist, or shiur) and sync. 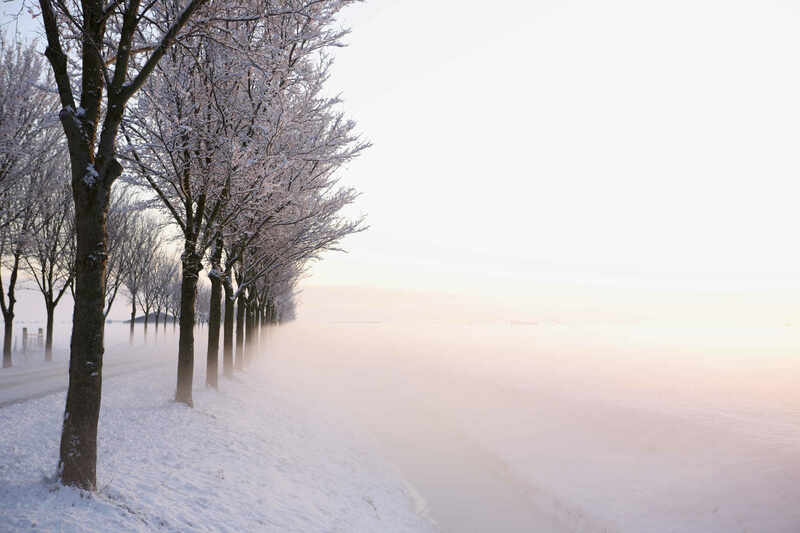 This entry was posted in community info, Hirsch, seforim on January 9, 2011 by Neil Harris. Most agree that it’s a good idea. There are plenty of people we meet, however, that we just don’t like. That’s OK. The mitzvah is to love them as Jews, not like them as people. Recently I experienced true Ahavas Yisrael from almost complete strangers. They helped me because it was a mitzvah, looking beyond my background or my hashkafa. Real Ahavas Yisrael, not the kind that end up as a short story in a gloss weekly Jewish magazine or as a chapter in children’s Gadolim biography. Real Ahavas Yisrael that wakes you up that the cup of coffee that you psychologically know you need in order to function. Real Ahavas Yisrael, I’m talking about the kind that reminds you that we have to help others because Hashem is constantly helping us. Real Ahavas Yisrael, the kind you daven that your kids will practice when they become older. Originally I was going to fill the post with several quotes on the importance of loving our fellow Jews from the likes of the Rambam, Rav Hirsch, and the Chofetz Chaim. I decided against this. Often in life we tend to meet people and try to figure out “what their angle” is. It seems that society has programmed us, well me, to think that most people I encounter have a hidden agenda. An act of kindness, a true Chessed, has an agenda as well, the most pure agenda, the will of Hashem. I am humbled that my creator has allowed me to meet a few people in my life that remind me of the kind of Jew I want to be. This entry was posted in Chofetz Chaim, coffee, Hirsch, Middos, personal on July 2, 2009 by Neil Harris. Recently, in what started out as a casual (not that I really believe in these things) conversation with the head of local adult education program, I was asked what I’m my interests are in regard to learning. I mentioned that I ‘enjoy’ mussar and had for many years. I was then asked how I got “into Mussar”? I smiled and responded that it was more like mussar got into me. This conversation brought me back to what I might loosely call a “defining moment” in my Yiddishkeit, while learning in Israel in 1990. I had spent my freshman year at YU and now I had an opportunity to actually learn Torah “all day” for the upcoming year. It was the end of my first day in a yeshiva in Israel, and our Rabbeim had left for evening, thus leaving about 40 fresh off the plane guys in the beis medresh with several of our madrichim and a few kollel-types. On the schedule was something called “Night Seder”. I’ll be honest, I had no clue what this was. A nice amount of guys left our yeshiva (which back then was in Gilo) and took a bus into town. The dozen or so left sort of just hung out. I looked around and saw that a few people were learning b’chavrusah and some were just “reading”. I decided to start checking out the books in the yeshiva’s small library. I happened upon a small book called “The Path of the Just” . I had never heard of it (not that I really had heard of much aside from Rashi, Rav Hirsch, and R Aryeh Kaplan) and decide to pick it up. Wow. I kept reading and reading and reading. I quickly realized that I wasn’t one of those people who didn’t really know all the things the RAMCHAL expected me to know. That was fine with me, I was willing to learn. I had always been interested in psychology and why we do what we do. That aspect of insight in the life of a Torah Jew was, as a 19 year old, something that I hadn’t formally come accross during my development in Torah observance. The whole idea of becoming a better person was an area of Judaism that I had thought about but never really read anything about, until now. I felt my world sort of opening up and I quickly began to see the “bigger picture” of a whole different aspect of Avodah. It was a classic Peak Experience, as Abraham Maslow would have put it. The end result of growth should be that we have a relationship of simcha with Hashem. Simple, yet deep. That evening and the subsequent ones spent reading and learning Mesillas Yesharim with several different people helped give me an anchor and a direction that I hadn’t thought possible. As I look back, it may have been a defining moment for me. This entry was posted in growth, Hirsch, Mussar, personal, seforim on May 21, 2009 by Neil Harris. This entry was posted in Hirsch on May 7, 2009 by Neil Harris.